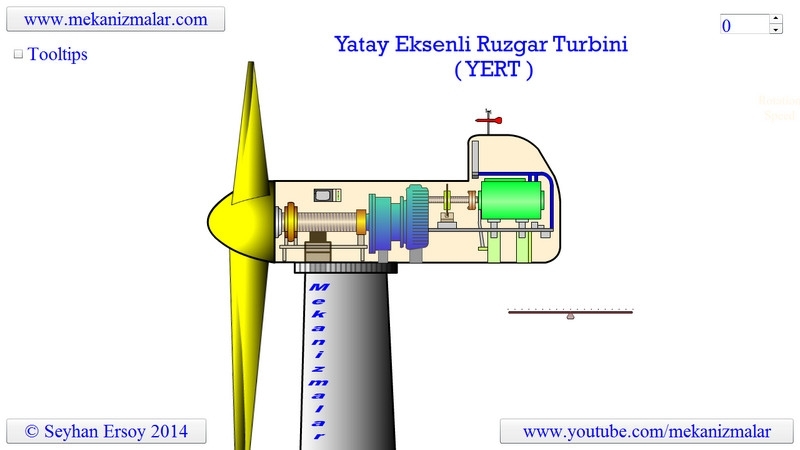 To make the animation simpler we use two bladed turbine rather than conventional three bladed turbines. However everything we mention here is valid for a wind turbine whether it has two or three blades. The three bladed horizontal axis wind turbines are impressive machines used for generating electricity. They have pros and cons just like any other power generating systems. However, their energy production is not as impressive as their size is. In order to produce energy comparable to an average dam, one would need to build many wind turbines. This is due to the fact that air has a low density, which is approximately 1.3 kg per cubic meter. The same amount of water flowing with the same speed can have almost 800 times more kinetic energy. Kinetic energy in the wind is converted to rotation motion by the turbine blades. This slow rotation speed is transmitted to a gear box by the main shaft shown here. The gearbox increases the rotation speed to the appropriate rotation speed required by the generator. This increased rotation speed is transmitted to the generator by a fast rotating shaft. The electric energy generated from this rotation motion is transmitted to the grid by the cables not shown in this animation. It seems that generating electricity with wind turbines is relatively simple. However, things are not so simple, for one the wind is not blowing at the same speed or the same direction all the time. This creates additional problems to be handled by the turbine, which requires additional components to overcome these problems. Changing wind speed is measured by an anemometer at the top of the wind turbine, which sends data to a control computer inside the nacelle. The computer then sends the control signals to the control system which change the angle of attack of the turbine blades. This causes turbine blades rotate in their axis as shown here. This action is known as the pitch control. There is a need for the pitch control to make the turbine work very efficiently in any given wind speed. Some small wind turbines are designed for optimum wind condition and they don.t use pitch control system. In these cases the price outweighs the efficiency. Also change in the wind direction affects the performance of the wind turbine as they should always face to the wind. Changing wind direction causes the wind vane shown at the top of the turbine to change direction. In a similar manner described for the pitch control, changing wind direction info is handled by an internal computer and activates yaw control motors to turn the nacelle in the direction of the wind. If the wind speed goes above a preset condition, things get tougher for the turbine to handle it, so it needs to stop operating. This is achieved by combination of two actions. The first action is that by turning the blades around on their axis with pitch control to minimize the area of the blades exposed to the wind. The decreased area reduces the rotation speed of the blades substantially. Then, the braking system on the fast rotating shaft is activated to stop the rotation of the blades completely. During the operation, heat is generated inside the generator and the gearbox and this should be handled by cooling system installed inside the nacelle. It great helpful to understand how wind turbine works. Just wondering if there is a clutch between slow shaft and the gearbox to eliminate hard brake at the fast shaft. Thank you.